A New Year brings new gardening opportunities! This year Seedy Sunday celebrates being 18 years old! WOW! A high point in the gardening calendar for many Brighton and Hove residents as well as for people who come from much further afield to enjoy this true community event. Both the retail and wholesale sides of Infinity Foods are very proud indeed to sponsor it! By shopping at Infinity, you, our customers are importantly making Seedy Sunday happen – so thank you for enabling us to also help make Seedy Sunday happen! We have always enjoyed supporting Seedy Sunday from its outset. 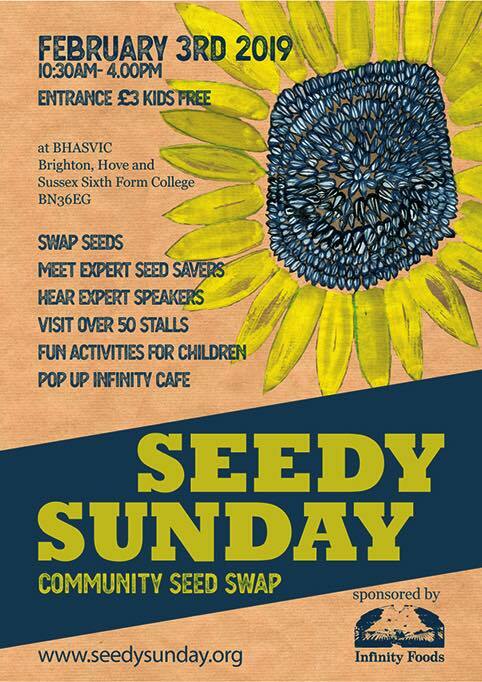 It is both the longest running community seed swap in the country and the biggest! Isn’t that something? It is run solely by volunteers who give their time and energy to make this special event happen. Seedy Sunday promotes seed diversity and seed sovereignty and we need to ensure both these with the threat of GMO’s still very real, other important issues such as the decline in bees, pollinating insects, amphibians and other wildlife through pesticide use and declining habitat. to find out more, read last years post about why Seedy Sunday as a movement is important. Where else can you, for the price of the £3 entrance fee, come away with pockets full of seeds you have swapped, so you can grow loads of nutritious, delicious fruit, veggies and beautiful, life-enhancing flowers? People come to bring seeds to swap but there is also a wide range of specialist retailers who come from across the country. It’s a chance to meet up with friends or make new acquaintances, and to think about getting going again in the garden after the winter rest and with Spring on the horizon. We will be there, as usual, selling a range of organic seed potatoes and shallot sets. We sell them at Seedy Sunday by the flower pot! That means you can get a small, medium or large flowerpot full of a certain variety, which is a cheaper way of buying them. We’ll also have info on how to grow the potatoes and all the varieties too. Infinity Kitchen will be there too, serving up a tempting variety of delicious hot and cold organic vegan foods, cakes, coffees and other drinks! Yum!